Did you ever try to find out what's on an avatars mind? 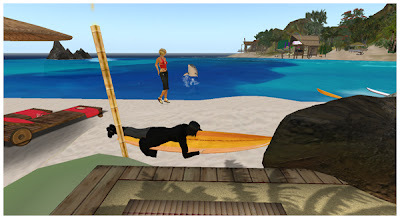 Here you can read more or less philosophical thoughts about life in Second Life by Nadja Revnik. When I woke up it was still dark or again? How shall I know? And how shall I know if I supposed to be jetlagged? In which timezone might Oahu be? And related to which other? Actually we just have one timezone in Second Life - SLT. But the residents seem to have a different relation to that one. Does time matter at all? But I fear that's a bigger topic not made for vacations, when the clock's ticking different anyways. 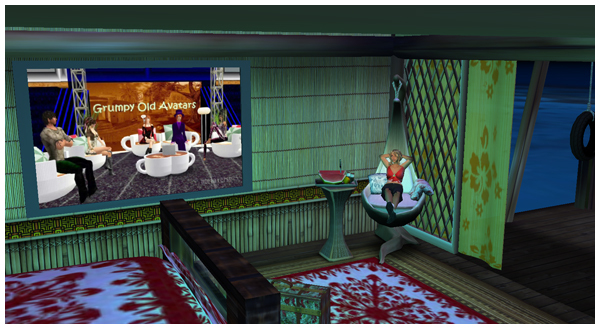 I stood up and as I can't talk with my friends on vacation, I thought about what to do...I never watched TV in SL, but now I tried out the metaverseTV. A show named Grumpy Old Avatars caught my eye. It was a talk show, informative and a bit funny as the title promised. TV seems to be an alternative activity as avatars would not spend their freetime watching trash, won't they? But well, isn't life in Second Life about communication and meeting people? So when dawn had broken I went out to explore the island and meet people as the security orb does not only keep out unwanted visitors. It keeps out wanted distraction as well. I was partly successful making contacs. They were not many avatars around, but when I walked a beach I saw someone stranded on a surfboard. I tried to talk to him about his situation, but he must have passed out and even the dolphin laughed about him. Most avatars I met seemed to be busy with relaxation and not up for a talk and I started to feel a bit bored. So I checked out the shops at the beach. You can shop surf gear, hawaiian clothes even for men, very unpractical boots for a sandy area, tons of flip flops as well, can get a new tattoo and more. If I'd been male, I would have bought the hula skirt, but in my case I saved a lot of money buying nothing. Nice spot for vacation photos. After a while of unsuccessfully searching for communication, I ended up sunbathing on my deck. 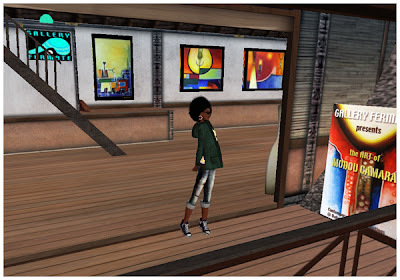 I saw the owner of the local art gallery on my minimap and as IMs within the vacation region are allowed, I told her, I really like the actual exhibition from an african artist in the Gallery Fermate. You should see the paintings yourself and travel to Oahu (it's in the main building in the middle of the sim)! Starshine in front of her Gallery Fermate at Oahu. After dusk I lay down in my bed to sleep again with the thoughts that after all on day two of my vacation I met someone really interesting and nice. Btw Starshine as well is a reporter for Stream Scene - a music magazine on metaverseTV. It's worth a look! Don't forget to participate in the poll about avatar vacation on top of this blog! Im just an Avatar living my life in a place called Second Life...whyever they called it that way...I just have this single life.